Scratch Hashbrowns – Abbey Co. This title is a little funny to me, seeing that hashbrowns basically have one ingredient… potatoes. However despite the fact, I feel like this is one of the most misrepresented breakfast foods of America. 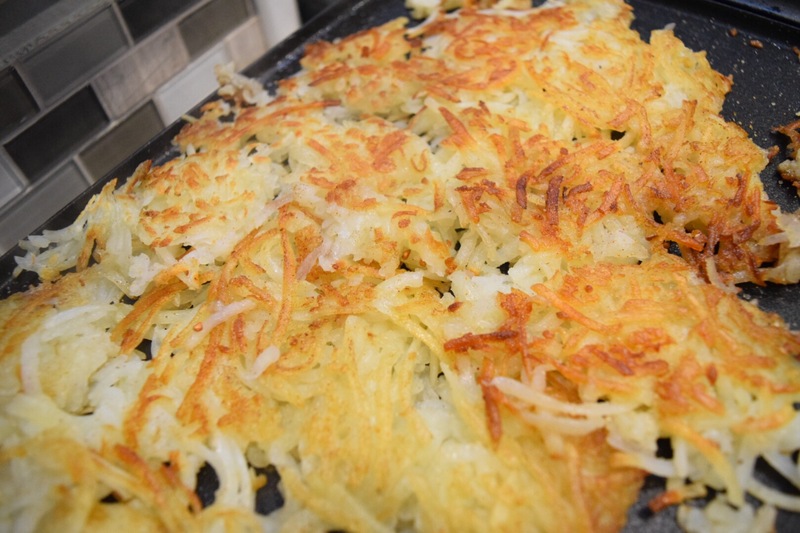 Home-fried potatoes… yes I have many friends who could whip up a delicious batch of those, but I am not sure I have ever met someone who doesn’t reach for a bag of frozen shredded hash browns when making this staple for breakfast. I am not going to make claims of being high and mighty either, since I never had even thought of this myself until hubby had mentioned wanting to try making some. I wash a home-fry girl since I would never make the ones from the bag since they never came out quite right… many times not cooked proportionally since we started with frozen potatoes and I admittedly have no patience. I wasn’t that excited to try this since I’m not the biggest potato fan, but the result really blew me away since they turned out to be so fresh, fluffy and delicious. Boil a pot of water and drop your potatoes in. Lower heat to medium at highest. Boil the potatoes on this low/med heat for about 30-40 minutes, or until potatoes start to show signs they are done. Your desired potatoe is al dente, so cooked but still firm and holding its shape. The skins should still be in-tact. Check your potatoes regularly, because if you see a potato skin start to crack or peel, remove it from water immediately. That means it is overcooked for the consistency you need. Place your potatoes on a plate or in a large bowl in your refridgerator overnight. This is important as you want to lose some moisture for a more crisp potato. Do not wrap or cover as this will hold in unwanted moisture. In the morning, peel your potatoes. Then, take your food processor and using your cheese shredding attachment drop your potatoes in, one at a time. It should shred your potatoes in nice long strands, just like you would get if you had been shredding cheese. If you do not have a food processor, you can use a hand-held cheese grater, using the larger gauge portion to shred the potatoes. If you don’t want to cook the same day that is fine, the shredded potatoes should hold in a ziplock bag for a day or two in the refridgerator. Take your skillet and melt 2 tablespoons of butter in it spreading evenly, then lay down a thick layer of shredded potato (about 1/4 of an inch thick). Sprinkle lightly with salt and pepper, and once browned flip to the other side to finish browning. If done correctly, they will be soooooo fluffy and delicious and fried just perfectly!! !